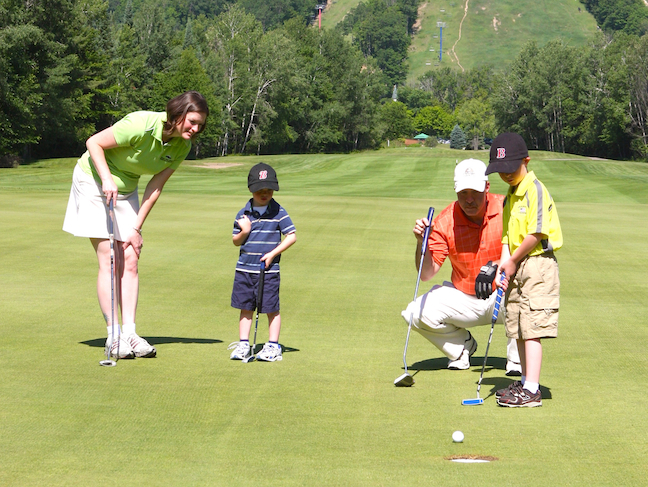 The larger cup at Shanty Creek Resort's Summit course is great fun for kids and parents alike. No, we’re not talking about opposition to New York Mayor Michael Bloomberg’s quest to ban oversize soft drink cups, but rather a superb idea by the noted Shanty Creek Resort in Bellaire Michigan, in the heart of northern Michigan golf country. In an attempt to make the game more fun, faster and easier for less experienced players and beginners, the resort has implemented a permanent program on the Summit golf course utilizing 8-inch cups on each hole, in addition to its traditional 4¼-inch cups. Shanty Creek is one of the first resorts in America to implement such a program on one of its major courses. Part of the PGA’ of America’s “Golf 2.0” campaign adopted to restore fun to the game, this initiative should enhance participation for women and junior players, two groups that are underserved and generally have lesser retention rates. Shanty Creek Resorts is looking to help grow participation in the game by providing the option of 8-inch cups and is also urging players to “Tee it Forward” – moving up at least one tee box. This also includes a new set of forward tees being developed at the Summit course ranging from 95 yards to 125 yards, which is also attracting youngsters and beginners to play more. Three of the most prominent issues women cite as reasons they don’t play – or did play and stopped – are 1) the game is too difficult; 2) it takes too much time; and 3) the holes are too long and unreachable in regulation. This combined Tee-It-Forward and 8-inch cup program should address all three, which bodes well for junior golfers whose moms can bring them along for some family fun. Hopefully, guests will try this new format and recognize that golf can be a fun activity for women, children, families and beginners of any age. “If you are a beginner or a family with young children and want a fun and non-intimidating experience with the game of golf, then this new program on the Summit course will be a perfect opportunity. Our goal is to grow the game’s appeal by making it easier, less time consuming, and fun,” Kautz says. To encourage more children, women, and families to play at the resort this season, children 17 and under will be able to golf for FREE on the Summit and Schuss Mountain courses with a paying adult seven days a week. Children will also be able to play FREE on Arnold Palmer’s The Legend and Tom Weiskopf’s Cedar River golf courses on Sundays after 2 p.m.
For more information about Shanty Creek Resorts and its new 8-inch-cup program, and to book your next golf vacation, visit www.shantycreek.com.